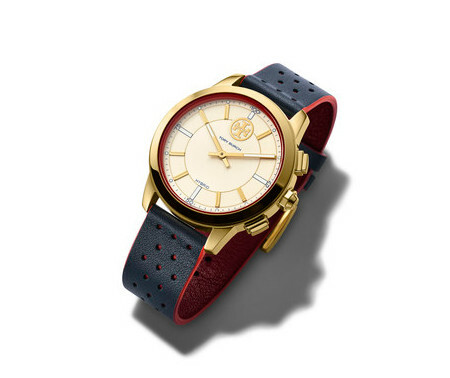 Arriving in a quartet of distinct styles that will include a navy perforated leather strap with pops of red; a grosgrain fabric strap in a classic navy and ivory color combination; and gold-tone bracelets with toprings in orange or navy, you can be sure that fashionistas will be spoilt for choice. The Tory Burch Collins hybrid smartwatch has been deemed to be the ultimate convergence of Tory Burch design alongside wearable technology, merging the elegance and simplicity of an analog watch with the capabilities of a world-class activity tracker. It might not look like much on the surface, but you can synchronize it to a smartphone over Bluetooth, making use of its dedicated app that plays nice with both iOS and Android platforms, to take advantage of several features. Some features include precision timekeeping that changes time zones automatically when you travel, having a second time zone so that you know what time it is back home, notification technology that discreetly indicates when you have a phone call, text or email, activity tracking capability that automatically tracks and monitors daily activities, while keeping track of the length and quality of sleep with the Tory Burch Collins hybrid smartwatch app. Interestingly enough, this is one of the few smartwatches that do not require a charger, since it runs on coin cell batteries that enable extended use.